The title or subtitle of a book is usually a given it says what is on the tin. However, McCall’s book while being adamant and exciting on the matter of the Loyalist clergy has next to nothing to say on the English revolution. In this circumstance, it is unclear to me whether the author chooses the title or as I suspect the editor or publishers did. The author has quite deliberately steered away from a political interpretation in her work and has not followed the standard practice of drawing upon an archive to “support particular points” The John Walker collection of manuscripts is held in the Bodleian Library, Oxford. McCall’s book is probably the first full study of this group. It is hard to believe that this excellent collection of oral histories has not been mined before. It is to McCall’s credit that she was prepared to spend a long time studying this archive. Her book looks to be a labor of love. The under use of the Walker archive by historians is a little mysterious as it appears to contain a goldmine of material. However, this stuff comes at a price in so much some of it might seem to be fool’s gold. Drawing political conclusions from a relatively unreliable source such as an archive based on oral transcripts is a challenging and complicated thing to do. Which is probably why McCall has not done so. Does this detract from her book for me it does? Having said that I am not opposed to the genre that is oral history. I spent two years in an oral history archive, and it was an incredibly rewarding experience, but it does have its limits. To her credit, McCall appears to have avoided a significant number of the pratfalls of such research. Hopefully, McCall’s book will provoke an interest in the archive. The Walker file began life when in 1702 following the publication of Edmund Calamy’s work which cataloged some ministers who were driven from their livings during the restoration of the monarchy in 1660. John Walker was given ‘over a thousand letters’ along with contemporary letters and legal documents dating back to the 1640s and the 1650s, They catalog a trail of misery for large numbers of clergy who supported the royalist cause in one form or another. The strength of the book is the detailed description of the various maltreatments of Loyalist clergy at the hands of the Cromwellian regime. For any student wishing to study the impact, the civil war had on significant sections of the population this book would be a good start. John Walker was born in 1674 in Exeter. According to R. Freeman Bullen, “the “Sufferings of the Clergy" is really two distinct works. The first part treats of ecclesiastical affairs under Puritan rule part two deals with the persecution suffered by individual clergy; it is this moiety which will mainly interest the local historian. Walker had been engaged upon his work for about ten years when it was finally published in 1714. This means that from 60 to 70 years had elapsed since the period of the sequestrations and that to a very great extent Walker was dependent upon existing documents, plus tradition, for his data. His notes and correspondence still exist in the Bodleian Library, and from these, we may gather some ideas of his method. “Walker conducted his research using printed and manuscript sources available to him. He also directly solicited information, via a circular sent to archdeacons to disseminate amongst parish clergy. He received over a thousand letters in response. After his individual death accounts were deposited, along with his other papers, as the J. Walker archive in the Bodleian Library”. In many ways, McCall faced the same problems encountered by Walker. Both historians had to interpret the material as best they could. Both questioned how accurate and truthful the records were. As James Mawdesley from the University of Sheffield points out in his review of the book ““None of this is to suggest that these clergymen only accepted their lot as poor sufferers for their king. Jonathan Swift, the grandson of Thomas Swift, the vicar of Goodrich in Herefordshire, claimed that his grandfather’s setting of a trap in a river resulted in the deaths of 200 of the enemy (p. 107), and McCall has calculated that no fewer than 150 of the Walker accounts include acts of aggression by the ‘sufferer’ (p. 201). McCall’s book establishes that the attacks on loyalist clergy were sanctioned by the highest authorities with Parliament operating as a rubber stamp. While McCall treads carefully in her book to separate the subjective interpretation of walker’s collection from the objective assessment of the material this even for a trained historian is a difficult task for the general reader it is doubly difficult. This book is not therefore for the faint-hearted reader. I also agree with Maudsley when he says the book would “have benefited from being interwoven with a general account of the civil wars and republic: the execution of Charles I in January 1649 is omitted from McCall’s chronology, and it is not made clear when governance without a monarchy commenced”. Caution should be observed when viewing the Walker accounts of trauma. Those on the receiving end sought to back up their accounts in order not to be dismissed. Walker was a good enough historian to err on the side of caution himself when recording events and testimonies. There are inconsistencies within the archive and should it not be treated as verbatim. It is ironic in the least as McCall points out that the clergy who suffered during the civil war and under the Cromwellian regime despite the monarchies return to power the loyalist clergy in many places fared not better than under Cromwell. Charles II was more interested in settling old scores. As a large number of modern books on the civil war, it is extremely hard to pin down what side of the historian's war McCall comes down on. The title of the book is a little misleading. 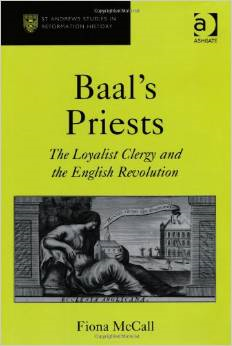 I am not sure who choose the title, but this is not really a book that explains the plight of the loyalist clergy in class terms. Having said that McCall is at least sympathetic to the historical writing of ‘Marxists’ like Christopher Hill. McCall comes down most favorably on the side historians Like John Morrill who saw the civil war as the last religious conflict of the 17th century almost a continuation of the Thirty years war. In Baal’s Priests, Fiona McCall has written an important study which will hopefully provoke an interest in the Walker manuscripts. The book is solidly researched and is written in a style that is both accessible to the academic and general reader. It is hoped that if McCall returns to this subject, she is able to draw some political conclusions from her hard work. It should be seen as an excellent introduction to the subject and not the final word on royalism, or the Walker manuscripts.